Home / Topic / Twilight Gemstone's choice? Home › Forums › Windstone Editions › General Windstone › Twilight Gemstone's choice? This topic contains 12 replies, has 10 voices, and was last updated by Stephanie 2 months, 1 week ago. Using the eBay test paint series “Twilight Gemstone” as an example, would you rather collect all sculpts of one color, or all colors of one sculpt? For myself, if I really loved a color, I would try to buy as many sculpts of it as I could. For Mystic Jade I loved the color and picked my fav sculpts to go after with the money I had. Of course it’d be nice to get all sculpts so you have the whole family. Now grab bags I have limited myself to color schemes, but multiple of the same sculpt. I like to have 2 or 4, it’s weird lol. Ironically, I’m too much of a completionist to try for color families; if there were only three pieces in a given color, I’d fret about the ones that were missing. I like my families big! 🙂 My White family includes almost every Western Dragon in production, but with test paints that would be impossible and I’d be bothered. Better to conga-line these things because then they always look like a complete grouping! 🙂 I do try to limit my congas (operative word here may be “try”…) to my absolute favorite species/sculpts, lest I basically end up with a bunch of small families by default. So I do fantasy Fennecs, natural SRFs, fantasy Cougars, eye-catching OWs, and all the Lap Dragons I like/can afford. 🙂 I’m trying not to end up with two congas of Pebble Dragons, but we’ll just have to see. I’ve been a color collector- it makes it feel like a bunch of individuals of a single (or a few related) species. Congas like Nightcrow’s lap one look cool to me, but I don’t think they’d work for me. They’d feel too much like Warhol prints of a single individual. I’m a rainbow colour collector type person meaning I either like rainbow sculpts or like a bunch of sculpts in a rainbow of colours. I do have some small families and pairs but the for the dragons I have now, I have a bunch of fledglings and baby dragons in a rainbow of 10 different production colours. I don’t care too much about getting different sculpts in the same colours. I am happy with getting the same sculpt in a bunch of different colours. I have a bunch of fledglings and baby dragons in a rainbow of 10 different production colours. I don’t care too much about getting different sculpts in the same colours. I am happy with getting the same sculpt in a bunch of different colours. that’s me with fledglings, they’re a conga line of all the colors I like…. I tend to like certain Sculpts, but I don’t like all the colors a sculpt may come in. And not all color/pattern schemes look good on my favorite Sculpts either, in my opinion. There are also some colors that really don’t appeal to me for any sculpt – such as Pastel colors. It depends on the color. I only have one ruby, one emerald and one gold – I love these colors on specific sculpts only. Not all sculpts wear the colors the same way to me, so I just go with that! That’s very true! Some sculpts just look better in a certain color than others. I do love the Browns and Greens for their history! That’s a good point. I have an Old Brown mother and male (one of them’s one of the Very First Windstones, without felt!) and an Old Green male whom I’d really like to find a mate for someday. If anyone spots an Old Green mother without felt on Ebay for a reasonable price, PM me! 😀 The historical meaning of them makes them special in my collection even though brown and green aren’t colors I would want more of. This is such a tough question! There are sculpts that I definitely prefer (hello, baby uni! ), but there are also colors that I don’t like. So I get whatever I want, basically. If I like a sculpt and the color, then I want to add it to my collection. The only exception is my hatchers. I have every V1 hatcher in every color, including the two mistakes. The only one I’m missing is a Melody test paint. I’d still love to find one of those someday! There was a blue one that I tried so hard to win, but alas…it didn’t happen. I do love the Browns and Greens for their history! That’s a good point. I have an Old Brown mother and male (one of them’s one of the Very First Windstones, without felt!) and an Old Green male whom I’d really like to find a mate for someday. If anyone spots an Old Green mother without felt on Ebay for a reasonable price, PM me! The historical meaning of them makes them special in my collection even though brown and green aren’t colors I would want more of. I will keep an eye out! 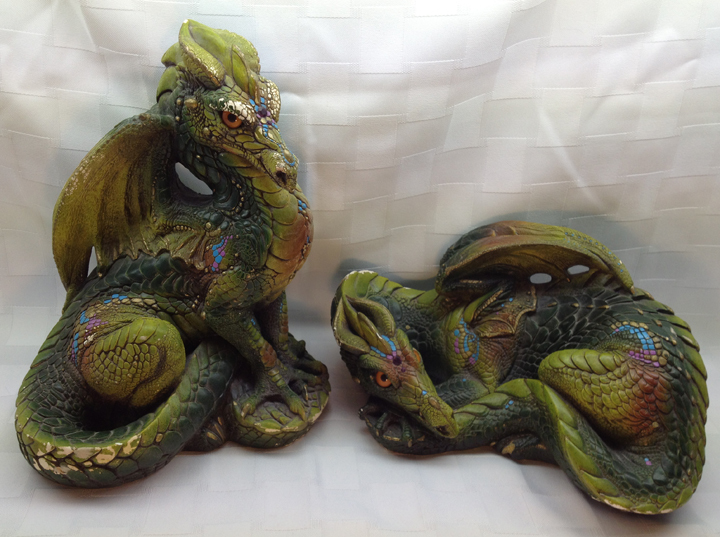 I have an old green male/mother pairing without the felt. They need some TLC though. Someday I’ll be able to ship them off for repairs.